Last weekend we had a visit from El Galeón Andalucia, a full-size replica of a 16th century Spanish galleon. The ship docked at the Alexandria Waterfront from 9 to 14 November as one of her stops along a journey up and down the Eastern U.S. Coast. As luck would have it, her visit coincided with the November full moon, which was billed as being the closest to Earth since the full moon of January 26, 1948. 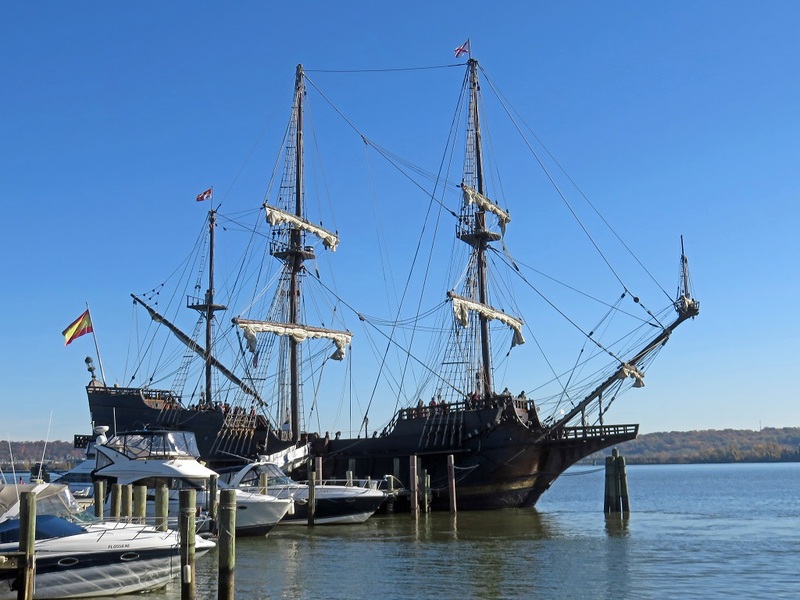 I had originally planned a 5-mile Sunday evening walk around Old Town Alexandria to enjoy the supermoon, but because of El Galeón’s visit, I added an additional morning event to get a look at her during daylight hours. I was half expecting to see some Zinn acolytes turned out to protest Spanish colonialism, but after last Tuesday’s election, there must have been more pressing perceived outrages elsewhere. Instead, the Sunday morning crowd yielded a more Disneyesque experience: hundreds queued up to go aboard, snoop around, and have optional family photos taken on the quarterdeck, complete with conquistador helmets and pirate costumes. It’s not that there’s anything wrong with that, but I much preferred coming back after nightfall. If more is left to your imagination, you can fill in whatever details you like. Here’s a few interesting shots from a walking tour of historic Del Ray, Virginia, which was for the most part a tour of the town of Potomac, Virginia, which existed from 1908-1929. Actually, almost any evening walk in Del Ray cannot help but take you past homes dating from 1895-1920, but given the casual nature of our walks, I never point them out. In any case, it seemed like a good idea, so I spent around six weeks researching the records, and we did exactly that: a formal tour of the unique housing and back streets of Del Ray. It included many of the old homes dating from 1895, but also a lot of the interesting Art Deco and Streamline Moderne warehouses and shops from the 1940s and 50s. Unfortunately, the person who asked for the tour chose not to attend. 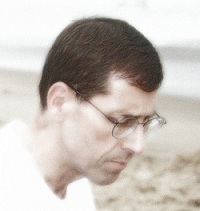 But I guess sometimes what you ask for is not really what you want. Last Saturday I took a day off from group hiking to explore Lake Frank, in Montgomery County, Maryland, for a hike our group is doing this coming Saturday. 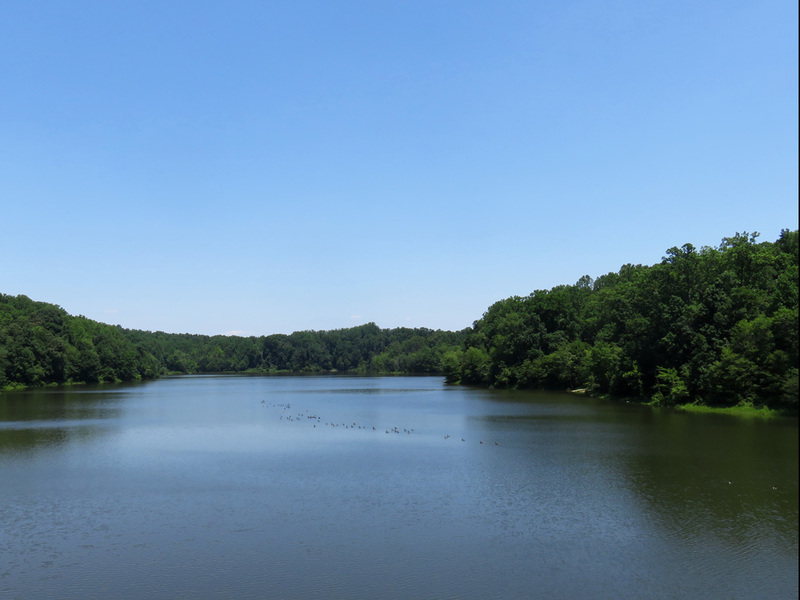 Lake Frank is only about 10 miles from the I-495 Capital Beltway, but since it is nestled in the 1800-acre Rock Creek Regional Park, it’s a great place for a country hike. I’ve been planning to do a hike at Lake Frank for some time, but when I first visited the trails were torn up due to a sewage line construction project. I checked on it again this Spring, but the ford over North Branch Rock Creek was always too high to cross without getting your feet wet. Finally I decided to circle the lake counter-clockwise. The stream crossing is at the end of the hike, so getting your feet wet doesn’t matter much. The resulting 5-mile route is pretty straightforward, heading west and north past the Study Pond and some of the Lathrop Smith Center outbuildings before turning south to hike past the Pioneer Homestead, over the Valient Covered Bridge, and along the west shoreline of Lake Frank to the Lake Frank Dam. To add a little more meat to the hike, the route continues downstream from the dam to the junction of North Branch Rock Creek and Rock Creek, and follows Rock Creek downstream a bit before returning north along the east bank of Lake Frank. Directly east of the Nature Center, stepping stones across North Branch Rock Creek lead back to the starting point. The whole hike takes around 2 hours; maybe a little more if you stop for a break. As it turned out, the counter-clockwise route was probably better than the clockwise route I had originally planned: the hillsides along the west bank of Lake Frank are quite steep, and the trail (aptly named “Old Nasty”) is narrow, so going downhill is a pretty good option. You still have to go back uphill on the east bank, of course, but the Lakeside Trail is paved and graded, making the long climb a little more conducive to good conversation. All told, a pleasant hike, easily accessed from anywhere in the Washington DC area. Meadowside Nature Center has plenty of parking, a friendly staff, and nice facilities, and once you get away from its immediate vicinity there aren’t a lot of folks on the trail. The Pioneer Homestead and Valient Covered Bridge are picturesque, and most of the hike is in the shade, so on a hot summer day, you’re still fairly cool and comfy. This past Friday I drove out to Shenandoah National Park with a friend to reconnoiter an upcoming hike near the Harry F. Byrd, Sr. Visitor Center, in the Big Meadows area of the park. The planned hike is a counter-clockwise loop, about 5 miles of smiles, although the elevations changes and inevitable twists and turns along the trail run the distance a bit higher. (Your mileage may vary, as the disclaimer reads.) The surface is dirt woodland paths, often rough, rocky and rooty, descends about 1200 feet to Rose River and the same amount back up, plus a bit, before returning to the starting point elevation. The hike starts at Dark Hollow Trailhead and leads 0.8 of a mile down the Dark Hollow Trail to the bottom of Dark Hollow Falls and the junction with the Rose River Fire Road. About halfway down the trail it intersects and parallels Hogback Branch, the not-so-romantically named stream that feeds Dark Hollow Falls. Below Dark Hollow Falls the trail intersects the Rose River Fire Road, and after turning right and following the road across a footbridge over Hogback Branch, a left turn puts you onto the Rose River Loop Trail. The trail follows Hogback Branch downstream about 0.8 of a mile before recrossing Hogback Branch on another footbridge. After crossing the bridge, keep an eye out for the trail blazes: next to a crumbling old concrete base for an air compressor that was once used by the Rose River Copper Mine, the trail turns right — the seeming “trail” of pale blue-gray rock chips that goes uphill simply leads to the old mine shaft, which is now filled in.1 Shortly after the turn the trail turns left and parallels Rose River upstream to Rose River Falls, which makes a good place for a break. A black bear just happened to be hanging out near the Rose River Copper Mine, the first I have seen up close since running into a pair of black bear cubs near North Marshall Mountain late in 2013. Black bears are not an endangered species, and they are the most numerous of all bears, but you don’t get this close to one just any day of the week! After the Rose River Falls, it’s an uphill slog for much of the rest of the hike, mostly over rooty, rocky trails. The remaining mile and a half of the Rose River Loop Trail features a couple of switchbacks before intersecting the Skyland/Big Meadows Horse Trail, and a left turn takes you almost all the rest of the way up to Skyline Drive, where the horse trail crosses Rose River Fire Road. The stretch along the horse trail is about 2 miles of rough uphill hiking, so for some relief, a short detour along the fire road across Skyline Drive allows a break to enjoy the view from Fishers Gap Overlook. From Fishers Gap Overlook, a 200-foot walk southwest along Skyline Drive reconnects to the horse trail. Turn right and follow the horse trail the final 1.25 miles southwest to the Song of the Forest Trail. From there a left turn onto the Song of the Forest Trail and a short 0.2 of a mile walk, recrossing Skyline Drive, ends the hike back at the starting point at Dark Hollow Falls Trailhead. All told, an enjoyable hike! The second half is a little challenging since it’s almost all uphill, but the total distance is short enough that the hike is not too difficult. Last weekend we took a nice hike up in Maryland, at Patapsco Valley State Park, just south of Baltimore. For the first part, we crossed the river on a suspension bridge and hiked a 1.25 miles upstream on the Gristmill Trail (gray), recrossed the river again on another suspension bridge near Ilchester Road, and returned to our stating point on the right bank of the river, a total of 2.5 miles. For the second part, we hiked up Cascade Trail, crossing the stream several times before turning off to follow the Morning Choice (yellow), Old Track Loop (red), and Ridge (orange) Trails back to our stating point, for a total hike of around 5.5 miles. The hike offered quite a variety of scenery. The Gristmill Trail is relatively flat and paved on the left bank and runs adjacent to the B&O Railroad track, while on the right bank it is mostly dirt and a bit more rugged. Historical markers provide information about construction of the railroad and the history of Patapsco Valley. Here and there a few princess trees were still blooming. The river is strewn with rocks and rapids below Bloede Dam, while in the calmer waters above the dam a pair of Canadian Geese were shepherding their goslings. The second part of the hike features rugged and wandering dirt paths through the forest, and the Cascade Trail passes Cascade Falls and several smaller rapids upstream, and one of the several stream crossings left me with wet sneakers. Bloede Dam is an interesting piece of history. It was built in 1906, went into operation in 1907, and was the first submerged hydroelectric power plant: the machinery was underwater, inside the spillway. It also included a 200-foot wooden fish ladder, which tends to dispel the popular notion that wildlife conservation started only with the advent of Captain Planet and Earth Day celebrations. The power plant was finally taken offline in 1924, overcome by more efficient plants elsewhere and the ongoing problem of clogging due to river debris. The dam was severely damaged by Hurricane Agnes in 1972, and in 1992 the Maryland Department of Resources spent $1.58 million to build an improved fish ladder. The dam is scheduled to be removed in the fall of 2016, leaving only rocky river rapids in its place, so there’s only a little time left to get a look at this piece of the past. 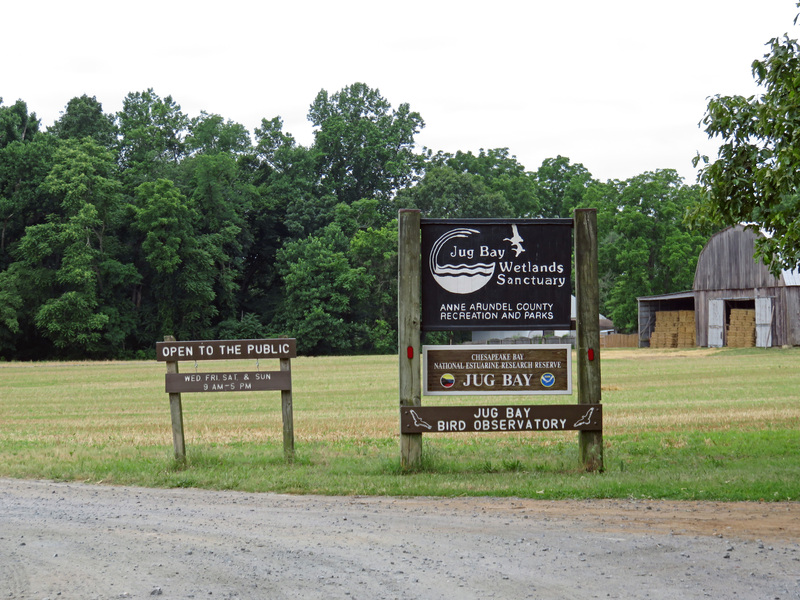 Patapsco Valley State Park is only about 30 minutes’ drive from the Washington DC Capital Beltway, or about an hour from Northern Virginia. It’s probably a good idea to check with the park ranger before planning your hike, since the Gristmill Trail will undoubtedly be closed during the demolition of Bloede Dam.